I like my coffee like I like my women: dark and sweet. Actually, that's not really true. I'm not all that big a coffee drinker at all. I just wanted to start this post off with that line. My wife is dark-ish and sweet...well, at least most of the time. But if I drink coffee at all, I like it milky and sweet. I'm a wuss when it comes to coffee. So if any of you are like me, you'll definitely want to prep this stuff up with lots of milk and sugar, and maybe even some water before you drink it. In the manner of a true foodie-hack, I did drink some straight from the bottle. It's bitter and STRONG that way. Whoowee! It tastes like arse, but it'll wake ya up, though. The bottle recommends mixing it with two parts milk or water for every one part concentrate, but that can be adjusted to suit your personal taste. Prepared the proper way, with a bit of sugar of course, it's mild and tasty. I'm a little more into cold coffee drinks than hot ones, even in the winter. So I guess this stuff is kind of up my alley since it's meant to be drunk cold. I'm going to try to not dock any points just because I'm not a coffee guy, although Sonia, who's a little more of a coffee connoisseur, wasn't even quite as thrilled as I was. And just for the benefit of you folks doing research on Trader Joe's coffees, and to keep you on our blog for a bit longer, rollicking in our ocean of glorious product reviews, I'm gonna go ahead and provide the following links to other coffees we've reviewed. We've checked out Café Pajaro, Italian Roast, Gingerbread Coffee, Kauai Coffee, and New Orleans Style Coffee. Of the ones I've personally tried, I would have to put this one near the top of the list. Sonia would put it somewhere in the middle. 4 stars from me. 3 from her. Ooh, this looks good~ I want to try it! Thanks for sharing your thoughts. This post was worth it for that first line and the immediate backpedal that followed. haha This drinks sounds good. Believable coffee stains. I judged your cleanliness for a moment before I realized the stains weren't real. Thanks, tigalilee. Yeah I though about clarifying that the stains were part of the packaging, but then I thought "Nah, they look pretty artistic, if readers want to attribute them to me, that's fine." Just tried this last week. I'm a big coffee fan, and I make my own cold-brewed coffee for iced coffee (but it takes hours, so I thought this would be good in between brews). It is very Arabica-y, so if that's the kind of coffee you like (more Dunkin Donuts than Starbucks), you might love it. I add water, then a little half and half and either no-calorie sweetener or a sugar-free coffee syrup (vanilla is good) with ice. It would work hot, too. The samples in the store (with cream and a drop of liquid Stevia) were tasty. The bottle goes a long way - a good deal, I think. Awesome, Ann! I like the comparison to DD and Starbucks. As a not-so-often coffee drinker, I'm not familiar enough with those to compare it to this. Hopefully that will further enlighten our readers :) Thanks for the comment! Gosh, Nathan, I always get a lift from your posts :). 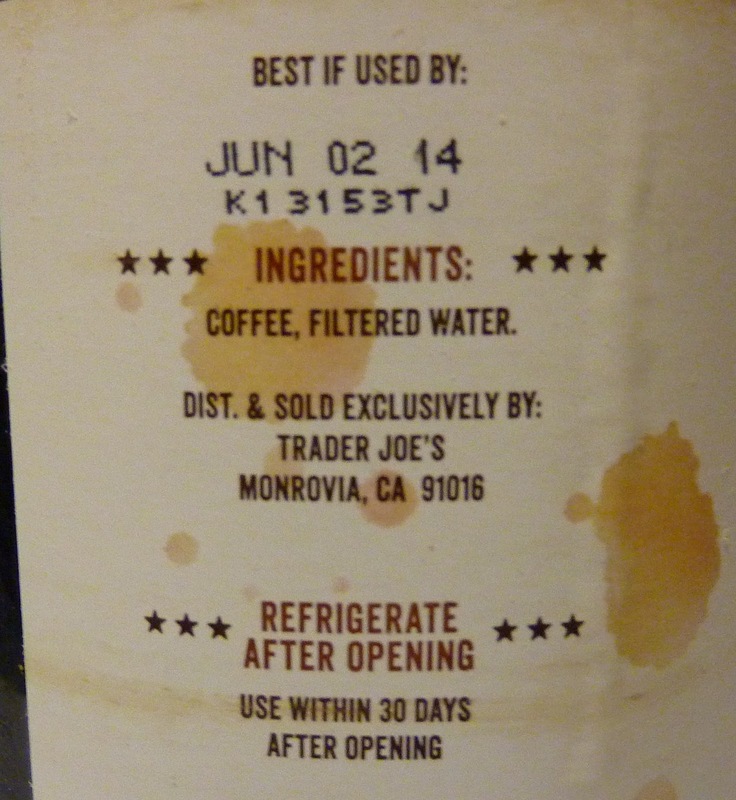 I love Trader Joe's and I really love me some cold brewed coffee. I agree with Ann. This is too much like donut coffee for me. For those coffee addicts out there, buy yourself a Toddy Brewing system and use your favorite coffee. Fantastic hot or cold. I even whip it into a Frap kind of thing for pennies a serving. Take that SixBucks! Keep up the blogging. We love you guys! I was soooo happy to see this product on shelves! I have developed a nasty iced coffee habit this summer, and at $3 a pop, it was adding up. I have been substituting my daily iced coffee at work this week and I really like it! The bottle will last me 2 weeks of work and that ends up saving me a nice bit of money. Yep, most store-bought iced coffee is a ripoff. You can also use it for some 'zing' in alcoholic drinks (like a coffee martini or a tasty mudlside; better than coffee liqueur). And made into a coffee slush with ice/sugar/milk in a blender. (Best to add sugar first.) Besides the alternate Toddy system above, I also recommend the Aeropress. Makes small high-strength shots that are closer to cold brew concentrate, not bitter at all. an add hot water for regular coffee, cold water/milk for iced,or ice for a frappe. Thanks for your kind words, Laura! That means a lot. And thanks for your suggestion about an alternative...that will probably come in handy for the real coffee lovers out there. Yeah, Judi! That's a good point, too. I didn't mention the economic advantages of this coffee for the casual coffee drinkers. Haven't seen this yet but I will be getting some! Generally great for iced coffee, and works for hot too. Did you know that Burger King *used* to have similar concentrate for their regular coffee? (I think DisneyWorld still does.) It tends to taste smooth and not be bitter. I miss the old BK coffee! On a (somewhat) related note, does anyone here like the TJ instant coffee pre-mixed packets? (W/sugar&creamer). Has it been *gasp* discontinued? I haven't seen it here for at least a month, was hoping it was just a temporary out-of-stock situation. Thanks for the info, Steven. I was not aware of BK or DW's use of coffee concentrate! Good to know. And no, I've never even seen TJ's pre-mixed packets, but if I do, I'll check them out. Whoa, stopped by TJ's and this concentrate was $7 per bottle! For some reason I thought it was around $3-4. That changes things a bit. I might just continue making my Aeropress "concentrate." Doing the math: The bottle is the equivalent of 6 16-oz cups of coffee (at the recommended 2:1 ratio). Fewer if you like it stronger. So that's over $1 per cup for market-bought DIY coffee. Kinda steep imo, but the convenience is there. Cold brew coffee is expensive, even if made at home. I use fresh ground (not too cheap) beans, a large Mason jar, and a coffee filter. A ratio of 4:1 (by weight) water:coffee gets about four cups of brewed coffee (some call it "extract") from a pound of beans. Even if you double that (and I don't always fully dilute), it's at least $1 per cup. Home cold brew is smoother than TJ's, I think, but theirs is good. That's a good point, steven, and since my wife actually made this purchase, I was only made aware of that fact a short while ago. It's $7 a bottle at our local TJ's, too. It's reasonable if you compare it to individual cups from cafes, but it's pretty expensive if you compare it to other store-bought coffee like you said. The funny thing is, when I was in the store I thought I saw here that the price was $3-4 or so. And when I came back, there was no price mentioned! Ann, thx for the e-z cold brew method. Does it make sense to use a pretty fine grind for better extraction? The Aeropress also makes a hot (below boiling!) "extract" that is really smooth, kind of like a cross between espresso and cold extract. Traditional advice is to use a very coarse grind for cold brew, and that's what I use. But I've read some recently who prefer a fine grind. So I guess I'd say experiment. This stuff may not get 4 stars from diehard coffee connoisseurs but it is a GODSEND for slightly discerning moms, students, & working people who need a bit of bliss (my preference is 1 part concentrate to 2 parts soy milk over lots of ice) that can be made in 10 seconds in the middle of the afternoon. This has satisfied my occasional temptation to throw down $6 for an iced coffee at Philz or Blue Bottle. I always get such good ideas from the other posters here. Despite owning a Cuisinart drip, French press, Chemex, Toddy maker, Starbucks Barista espresso machine and one of those Vietnamese drip jobs you put on top of a cup, I simply must now have an Aeropress! I'm a coffe junkie, for sure. Maybe there is a twelve step for my addiction! P.S. I do really enjoy TJ's French roast in both the traditional methods and the cold methods. Oh, with Cookie Butter on toasted Eziekiel bread starts a morning off right. 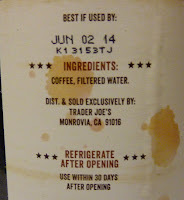 A couple of Aeropress tips: be sure water is below boiling temp. And after pressing plunger firmly to squish the grinds, just remove the filter cap, push the plunger further (over a trash bin) to pop out the grinds, rinse off the end of the plunger, and store it like that (with plunger all the way in the housing). Next time, just wet the end of the plunger and it'll slide out easily. I also use a little battery-powered hand frother/mixer to stir the water and grinds before plunging. I love your blog, I also love going to Trader Joe's to find some new stuff...just picked up some Thai Dry Chili Paste and came here looking to see if you had a review, don't think you do, but I saw this product there as well, and was like....are u for real? why? Please, please please, make your own ice coffee at home. 1/2 lb of your favorite ground coffee (mine is Cafe Bustelo) 1 gallon of water. Put the grounds in a giant container, add water, make sure the grounds are all wet, cover and let it steep for 8 hours. Strain out the coffee grounds, using a colander and cheese cloth (large coffee filter would work, just takes more time). And your done. Thats the "cold brew" process. Keep covered and refridgerated and its good for about 3-4 weeks. Good tip, June! Probably cheaper that way, too. Good call, Brandi. I am slowly being desensitized and addicted to caffeine, but I want to start getting away from it. Decaf would be nice. I think this stuff is awful. I was googling it to find ways to fix it. It's SOOOO acidic. I've even tried diluting it 1:8 with water, then adding my soy or almond milk & the acidity still makes it curdle. It also has a strong acid flavor & gives me acid reflux. I thought it would be an awesome way to make morning coffee easier for me, but the flavor is nothing like the warm, chocolatey nuances I get from hot brewed coffee. I'm surprised I'm the only one experiencing this. I do really like coldbrew and this one sounds great. Do you know where the concentrate is manufactured? How long is the shelf life unopened?